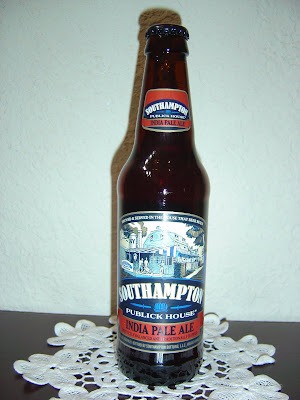 Now I'm drinking Southampton Publick House India Pale Ale brewed by Southampton Publick House in Southampton, New York. They did bottle it in Wilkes-Barre, Pennsylvania, however. The story on the back talks about this being a balanced IPA, somewhere between a West Coast style and European style. The label also pictures the "House That Beer Built". Fruity and very light aroma. Oh, no. Unpleasantly grainy and earthy flavors start out and dominate here. Bread and toast and tea. Yep, seems like this leans European with their tea. Anyone have any crumpets so I can invite Lennox Lewis over? Lemony citrus dirty bad flavor. Dry band-aid finish. Really something to avoid. I haven't found an IPA I like. I'm not a big fan of hoppy. I've had friends Joel and Ed try to find something I'd like, but not with much success. Looks like you've shown me another IPA I should steer clear of! Hey Matt. Lots of people don't like the hoppy beers, especially IPA's. Ed and Joel are good resources, but if it's not your style, there are lots of other options. No reason to force it. This one just sucked, and that didn't really have anything to do with the bitterness.